The results of the tuberculin test vary and the reports are disparate. In the present study BCG vaccinated and unvaccinated normal healthy children and children with Tuberculous meningitis (TBM) (disseminated form) and primary complex disease (PC) (localised form) were evaluated with respect to their Mantoux (Mx) status and leukocyte migration inhibition test to purified protein derivative (PPD). A sizable number of the BCG vaccinated children were negative to the Mx test, but the in vitro responses (leukocyte migration inhibition test) to PPD of these children were normal. The negative skin test responses were thought to be due to the environmental mycobacteria. Almost equal number of children with TBM were positive and negative to the Mx test; though most of the children with PC were positive. The study therefore suggested that tuberculin test alone may not indicate the protective immune status of the child, conferred by BCG. Skin hypersensitivity testing and estimation of precipitating antibodies against A. fumigatus were carried out in 55 adult patients of bronchial asthma. Twenty percent of the patients showed an immediate hypersensitivity reaction and 7.2% showed a delayed type Ill reaction. Precipitin antibodies were present in 5.4% of cases. There were three possible cases (5.4%) of allergic bronchopulmonary aspergillosis among these 55 patients. Pertinent literature has been reviewed. Three cases of mediastinal fibrosis presented with pressure symptoms. Thoracotomy was both diagnostic and therapeutic with prolonged relief following excision. Literature is reviewed. 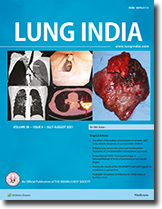 The details of six cases of pulmonary aspergilloma are presented in our seven years experience at Jawaharlal institute of Postgraduate Medical Education and Research, Pondicherry. Careful interpretation of chest radiographs of open negative patients with haemoptysis and the role of serum precipitins in such a situation is stressed. The literature is reviewed in brief. An unusual presentation of amoebic abscess in the posterior mediastinum has been recorded without any evidence of amoebiasis in the liver or other sub-diaphragmatic viscera. A rare case of congenital cystic adenomatoid malformation of the lung associated with esophageal atresia in a new-born is reported. A case of congenital diaphragmatic hernia through Bochdalek's foramen simulating a pleural effusion in a boy of six years is reported.